Welcome! 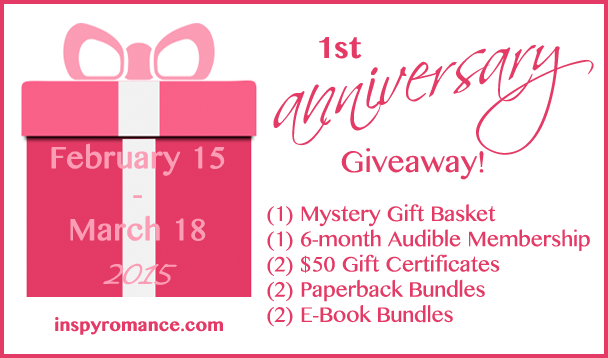 Can you believe Inspy Romance is celebrating our first birthday! Cue the music! Cut the cake! Pass the presents! Sure, it is our birthday, but we’re giving the gifts to EIGHT lucky winners. We’re doing things a bit differently this time around. No weekly winners, but we’ll draw eight names when the giveaway closes March 18 and announce all the winners on Sunday, March 22. We’re doing only ONE Rafflecopter for the whole five weeks this time instead of one a week, and you can enter as often as you like. Plus, as always, every comment counts from now until then as well. Got it? **NOTE: In some cases, the author is wiling to substitute a different title if you’ve already read the one in the bundle. Merrillee Whren: My husband Bob and I met when he moved into the apartment complex where I lived. My roommate, Pam, was over at another girl’s apartment when she met Bob and his roommate. She invited them to go to a birthday party we were attending that night at our old apartment complex. The two guys took their own car, but at the end of the evening, Bob insisted on driving me home, sticking my roommate with his roommate. The next day I had a teacher training seminar, and I told a couple of my fellow teachers that I had met a very interesting guy the night before. A year later we were engaged and six months later we got married on Valentine’s Day. Staci Stallings gave us a behind-the-scene glimpse of two of her books. Stacy Monson shared It’s a Love Fest! 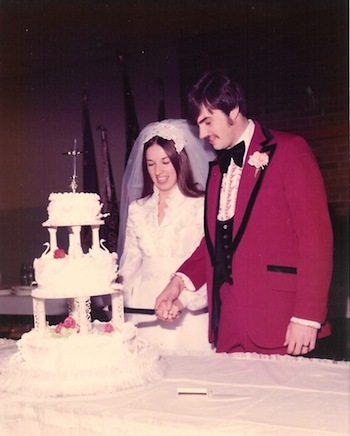 Carol Moncado shared some romantic stories from Inspy Romance Authors: How We Met! What a great way to celebrate love and romance this month! Thanks for hosting such great giveaways. They’re so fun to share about on social media. Have a blessed week, ladies! Happy 1st Anniversary Inspy Romance… Keep sharing the LOVE. Happy first anniversary! Looking forward to another great year! Happy 1st birthday Inspy Romance!!!!! You got something in common with me, my grand-daughter will turn 1 on March 2nd :-) Such an exciting time! Great giveaways you got going on, some awesome books & even more awesome authors! I’ve enjoyed every blog posted here in the short time I’ve been a part of Inspy Romance. Keep up the great work ladies…thank you for the encouragement & laughter!